Willa Obenchain’s life changed when she was abducted by Mohawk Indians when she was fourteen. After twelve years and the loss of her husband and two daughters, she decides to go back home to her family’s New York territory homestead. She intends to keep to herself and live alone, but her plans are dashed when she finds an injured Scotsman lying in her path and her feeling of obligation to nurse him back to health kicks in. When Willa rounds the road dragging her wounded Scotsman, Neil MacGregor, behind her, she’s shocked and dismayed to see that a lot has changed in he twelve year absence. Her childhood home is in disrepair, her parents are missing and rumored to be Tories, and the young Richard Waring she once adored has now become a man twisted by the horrors of war. With Richard, Neil, and her Mohawk brother, Joseph Tames-His-Horse, pulling her in separate directions, Willa begins to realize that her life of solitude might not be so solitary anymore. As Neil and Willa become closer, the homestead is plagued by tragedy after tragedy that are a lot more than coincidence and with the strong feelings against “savages” and anyone associated with them, Willa’s safety is unsure. With the possibility of losing the homestead to auction and Richard, Willa is willing to do almost anything to save it, but it seems someone else has other plans for her. Can Willa save her homestead or will she lose it to the ruthless Richard Waring? Will Willa choose to go back with Joseph Tames-His-Horse to the People as Burning Sky or will she find her place in the world she once lived in? Will Willa let Neil into her heart or will she drive him away with her thickly constructed walls? Can Willa prove her parent’s innocence before auction or not? Can Willa find a place in the world of her childhood or will she decide she needs the Mohawks to be happy? Ever since I saw this book was up for review, I was excited about it. So excited, I jumped on it with lightning speed and have been patiently awaiting a time for me to read this one. It was completely worth the wait. I loved this one! Though it’s a debut novel for Lori Benton, I couldn’t really tell. This book flowed so well and worked so well that this book is fantastic for any author let alone a debut author. This is definitely going on my “favorites” list. This book is set in post-Revolutionary War New York and it worked really well. The scenery is gorgeous and the terrain is rugged, which makes for the perfect historical novel. The author is very good at drawing you a mental picture of the lush, green terrain without being wordy and keeping you interested without being overt. The historical facts were sprinkled in without being too much or feeling like a history lesson and she showed a side of history few of us think about – what it was like after the war. It definitely worked well with the storyline and expanded on a very popular war. The romance in this book was kind of a love-triangle but was also one of the more sweetly subtle ones that I’ve read, but trust me it works and it works well. Never once did I feel like the romance was rushed or was disappointed with the romance being laid out for me. There was enough passion to make it feel real but enough emotional bonding to make a solid believable romance. 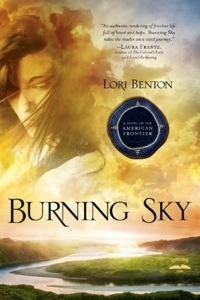 Lori Benton just crafted one of the best romances I’ve ever read. There’s also some drama and suspense in this book. It’s enough to keep the book interested but not too much to make you feel jolted around. It definitely worked with the storyline and though I could’ve called the ending from the first quarter of the book, and I did, I enjoyed the road to get to the end and didn’t mind at all that I guessed the ending a long time ago. Flow is definitely a strong suit of Lori Benton’s and I look eagerly look forward to anything else she has for me. Lori Benton’s first novel has made a fan out of me and I’d be lying if I said that she didn’t capture my heart with Willa Obenchain formerly Burning Sky. I can’t believe I enjoyed a debut novel as much as I enjoyed this one. I will jump at any opportunity to read more from this author and I can’t wait to see her grow. This author has created a fan and has me highly recommending this book to anyone looking for a 18th century Native American love story. Overall, I loved this book. This book is perfect for those that love historicals or books about the Native American culture. This book is great for adults and maybe mature teenagers. Children should stay away as there is some very emotional and possibly frightening scenes. I give this book a five out of five. The highest score I’ve ever given a debut before.